We have plenty of room at Western Containers. Western Container Services, linking Wharf, Road and Rail hubs with the rest of Sydney. Our two Sydney depots have a combined capacity of 5100TEU and boasts an exceptionally qualified and experienced team. From your empty shipping containers to the secure storage of fully loaded shipping containers. Best of all, our short-term or long-term rates are far less than most other traditional storage options. We are able to assist you to reposition your containers and cargos across the city or around the country with one call. Our facility has a storage capacity for both full and empty containers, to assist with your storage and repositioning needs with ease. Being a slightly smaller FCL depot in NSW our customer service is second to none so your containers are stored and transported how and when you wish. 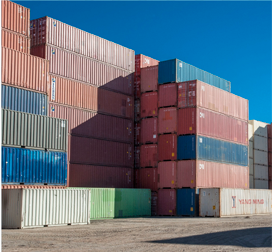 No matter how big or small your container storage needs, Western Containers can handle it. With heavy fork capacity, we can accommodate absolutely any load – including your out of gauge cargo. Easy drop off with no fixed drop off time slots. Shuttle service for FCL and MTY containers from Pacific National Sydney Freight Terminal. Full computer reporting of all EDI formats and reports. Storage for 1000 FCL TEU’s. Refrigeration Pre Trip and power. Any specialised or unique requirements are welcome. at Western Containers’ top-rated West Sydney depot.